The Atacama Desert is the desert of deserts. Located between the Pacific Ocean and Peru, some parts of it haven’t seen rain since humans began taking records. On average, it sees an annual rainfall of just 2 mm. In comparison, even the Mojave Desert averages 400 mm (15.7 in) per year. 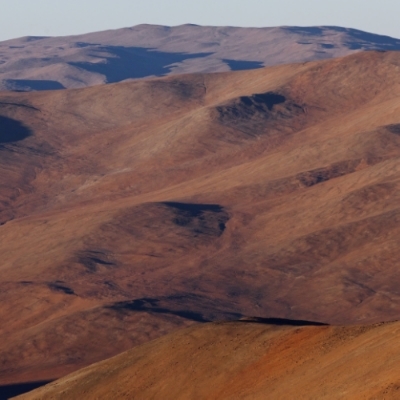 Scientists have realized that we can use the Atacama as a Mars-in-a-test-tube and study it in person without having to pay round-trip rocket fare. In 2009, Spanish and Chilean scientists trekked out to the driest parts of the Atacama to see if life could exist in such a hostile environment. They knew that life needs water, but wanted to see just how extreme that requirement could be pushed. Being careful not to contaminate their samples, they dug 2 m (6.5 ft) and collected the soil to see what was stirring. First, they found that the soil was extremely salty, consisting of halite (table salt) and perchlorate (a chlorine salt). These salts were able to absorb what little water there was in the soil and keep it from freezing. More importantly, these briny solutions contained specially evolved bacteria, thriving in salt concentrations unable to support most other species of life. These extremophiles (organisms that grow in extreme conditions) are not new to biology, but the bacteria found in the Atacama are important because of the implications they have for the possibility of life on Mars. The vast majority of water on Mars is frozen in the polar ice caps, with only bits of evidence here and there of water flowing long ago. The red planet’s soil is, for the most part, believed to be too arid and cold; the air pressure, too low to support liquid water. Therefore, when NASA scientists recently announced that they found evidence of perchlorate-rich liquid water trickling down the slopes of Mars, the inevitable question was if Martians also existed. Little green men aside, Martian life could in theory resemble the extremophiles in the Atacama. What exactly Martian life could look like depends on which hypothesis of life you follow. If Mars is similar enough to the Atacama, it may be that it harbors similar microbes with an ancient common precursor. Around 4 billion years ago, the solar system was in a period of “heavy bombardment,” where comets and asteroids regularly collided with the Earth, the Moon, and Mars. Scientists believe that these impacts were strong and frequent enough to transfer material between celestial bodies. These transfers may have seeded both Earth and Mars with the same building blocks of life. Others believe the elements of life come from other celestial bodies traveling through our solar system. In 2004, a NASA probe detected glycine, a basic building block of life, from the Wild 2 (pronounced ‘vilt’) comet as it traveled through our solar system. It is within the range of possibility, then, that passing comets and asteroids could have seeded both Mars and the Earth. 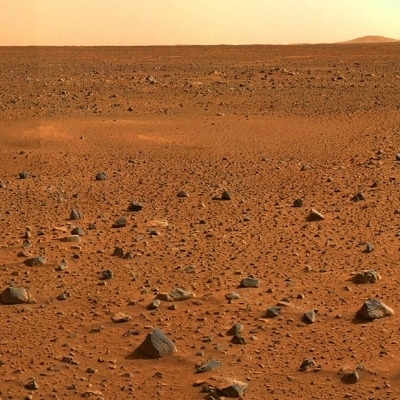 Alternatively, life on Mars could exist in an entirely novel way. The primordial soup of ancient Earth may have contained molecules with two key characteristics to eventually creating life: self-replication and self-organization. These basic components would slowly become more complex over time, leading to self-reacting RNA, then to single cells, and finally to what we would today think of as a living organism. Steven Benner of the Foundation for Applied Molecular Evolution argues that Mars may have had a chemically more attractive place for life to begin eons ago. The amount of borate, molybdate, and oxygen on Mars would have been more suitable for an RNA world than Earth was. RNA from Mars may have then transferred to Earth, seeding the origin of life here. Furthermore, NASA scientists at the Jet Propulsion Laboratory in La Cañada-Flintridge, CA just announced their latest support for the possibility of life on Mars. In a press release, Mars Science Laboratory project scientist Ashwin Vasavada explained that “observations from the [Curiosity] rover suggest that a series of long-lived streams and lakes existed at some point between about 3.8 to 3.3 billion years ago.” These “long-lived” bodies of water could have lasted from “hundreds to millions of years,” opening the distinct possibility for life to have taken hold on the red planet. According to lead scientist for NASA’s Mars Exploration program, Michael Meyer, "It's clear that the Mars of billions of years ago more closely resembled Earth than it does today." After its wet period however, Mars has since become dry, cold, and inhospitable. Therefore, regardless of how life could have started on Mars, it would have to had survived this drastic change of environment. But, living organisms, particularly microbes, are often found in some of the most inhospitable places. Keep your fingers crossed for some surprises hidden in the soil of the red planet.